Officer/Section Officer, Private Secretary, Account Officer, Court Master/ Stenographer grade ‘C’, Senior Translator, Junior Accounts Officer, Photocopier on Deputation Basis. Total available vacancies in Central Administrative Tribunal CAT Recruitment are 72 posts. Interested candidates have to submit applications in given format (Duly typed in double space) along with supportive documents within 45 days from the date of publication. Maximum age of the candidate for all posts is 56 years. Pay Scale and Educational qualifications for each post are given detailed in the table. Full details regarding Central Administrative Tribunal (CAT), New Delhi Recruitment Court Officer/Section Officer, Junior Accounts Officer vacancies application procedure, selection method, Vacancy related information are mentioned in the notification. Last date for Application form submission: within 45 days from the publication date i.e. 16-12-2017. 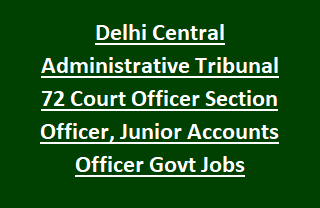 Total Available vacancies in Central Administrative Tribunal Delhi Recruitment are 72 posts. Court Officer/Section Officer: Any Degree from recognized University or equivalent. Go through the official notification for other posts educational qualifications. Maximum age of the candidate for all posts is 56 years as on last date for the receipt of application. Mode of selection for Delhi Central Administrative Tribunal recruitment vacancies is based on applicant merit in written exam/ interview. See the notification for full details. Interested/ Eligible candidates have to submit applications in given format (Duly typed in double space) along with supportive documents to the address mentioned below. Last date to receive application form for concern post is within 45 days from the date of publication. Copernicus Marg, New Delhi. Pin-110001.